3 days and 4 nights in the field, starting in San Antonio and ending in Austin. An optional 4th day of Cretaceous core examination in Austin makes the field trip 4 days and 5 nights. This field seminar consists of eight field stops and includes do-it-yourself exercises at two stops. The field trip guidebook is prepared, ready to go to the field. 8 days, 7 nights in Belize, flying roundtrip from Houston to Belize City. The field trip guidebook is prepare to show inner, middle and outer shelf environments and also the atolls. An up-dated map of sediment types of the entire Belize Shelf is field-checked in this seminar, as various sedimentary facies belts are examined, especially reef and reef-related facies. An overflight of the Belize barrier reef system is included as part of the seminar. 5 days, 4 nights, flying roundtrip from Houston to Veracruz, Mexico. This was a GSA field trip in 1990. Twelve field stops are made to field check most recent mapping of the sediment cover on this shelf. LANDSAT imagery, and computer-drawn perspectives combining sediment-type and bathymetry form the basis for interpreting the mixture of siliciclastics and carbonates across the Mexican Shelf. 5 days, 4 nights, flying roundtrip from Houston to Hamilton, Bermuda. 12 Field stops. 3 days, 2 nights, trip beginning and ending in Jakarta, Indonesia. Twelve field stops show the variety of reef types on the Pulau Seribu Platform which is an excellent analog for Miocene carbonates. 300 bottom samples, LANDSAT imagery, and detailed facies mapping form the basis for selecting field stops here. 4 days, 3 nights, flying roundtrip from Houston to Miami. I have run this field trip 15-20 times for Mobil and Conoco over a period of past 15 years, receiving excellent reviews and maintaining a flawless safety record. Detailed sediment-type maps and good bathymetric charts form the basis for this excursion. The field trip guidebook for this seminar is completed. 4 days, 3 nights, flying roundtrip from Houston to Miami to Bimini in the Bahamas. I have conducted this field trip 15-20 times for industry over a period of past 15 years, receiving excellent reviews and maintaining a perfect safety record. This trip is commonly run as an addition to the seminar on Modern and Pleistocene Carbonates of South Florida. 3 days, 2 nights, leaving Jakarta by bus, staying in Bandung. This field trip through the Rajamandala Limestone outcrops south of Bandung shows a classic depositional model for typical Miocene reef development in Indonesia: forereef depositional environments, reef facies, and backreef settings. Polished quarry slabs are examined to show reef textures in exquisite detail. Diagenesis of these deposits is also evaluated. An important feature of this field trip is an appreciation for the lateral scale involved with facies changes in Miocene reef settings. 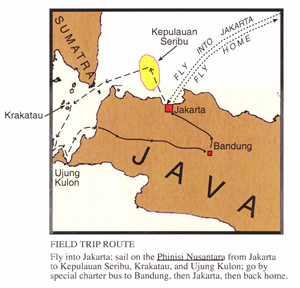 5-6 days, 4-5 nights, trip beginning and ending in Jakarta, Indonesia. Part One: Twelve field stops show the variety of reef types on the Pulau Seribu Platform which is an excellent analog for Miocene carbonates. 300 bottom samples, LANDSAT imagery, and detailed facies mapping form the basis for selecting field stops here. Then a field trip by bus through the Rajamandala Limestone outcrops south of Bandung shows a classic depositional model for typical Miocene reef development in Indonesia: forereef depositional environments, reef facies, and backreef settings. Polished quarry slabs are examined to show reef textures in exquisite detail. Diagenesis of these deposits is also evaluated. An important feature of this field trip is an appreciation for the lateral scale involved with facies changes in Miocene reef settings.